On September 2, 2018, State Councilor and Foreign Minister Wang Yi announced at the 7th Ministerial Conference of the Forum on China-Africa Cooperation (FOCAC) that the 2018 FOCAC Beijing Summit will be unveiled on September 3. Conducted on an unprecedented scale, the Summit will be attended by numerous leaders of various countries and representatives from all circles and supported by a series of side events more than ever. Leaders of China, 53 countries and the African Union (AU) Commission will attend the Summit. At the scheduled time, President Xi Jinping will co-chair the Summit with President Cyril Ramaphosa of South Africa. 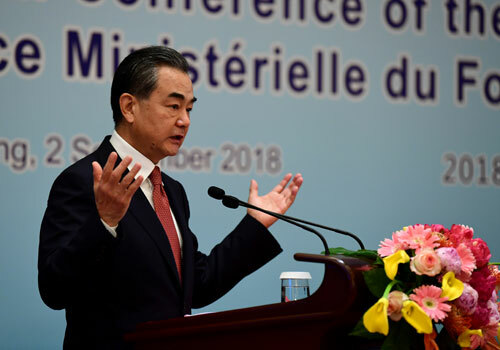 Wang Yi expressed that China and Africa agreed to set the theme of this Summit as "China and Africa: Toward an Even Stronger Community with a Shared Future through Win-win Cooperation", which shows the common aspiration of the Chinese and African people and complies with the inevitable requirement of historic progress. We hope to integrate the joint building of the Belt and Road Initiative between China and Africa, the Agenda 2063 of the AU, the 2030 Agenda for Sustainable Development of the United Nations, and development strategies of various African countries, so as to create new opportunities, explore new fields and open up new prospects for the development of China-Africa comprehensive strategic cooperative partnership. Wang Yi pointed out that at the Beijing Summit, President Xi Jinping, on behalf of the Chinese government, will put forward specific ideas of building China-Africa community with a shared future, and announce proposals and measures of the Chinese side for enhancing China-Africa cooperation in the future. These proposals and measures comply with the common aspiration of the people of various African countries and realistic needs of African development, and will surely deepen China-Africa win-win cooperation, and propel the development and revitalization of Africa. It is believed that this Summit will become an important historical event to strengthen China-Africa unity and cooperation under the joint efforts of all parties of the FOCAC.